Also known as shoulder top blade, boneless top chuck steak is a juicy, well-marbled, flavor-rich steak. Although boneless top chuck is suitable for sauteing or grilling either indoors or on the barbecue, broiling is a simple cooking technique that requires only a few minutes to bring out the maximum flavor in this tender, meaty steak. Broiling requires few pans and utensils, and cleanup is minimal -- always a plus at the end of a busy day. Place an oven rack about 6 inches from the broiler and turn the oven to the broil setting. Set a broiler pan, ridged grilling pan or cast-iron skillet on the oven rack and let the pan heat for 15 to 20 minutes. 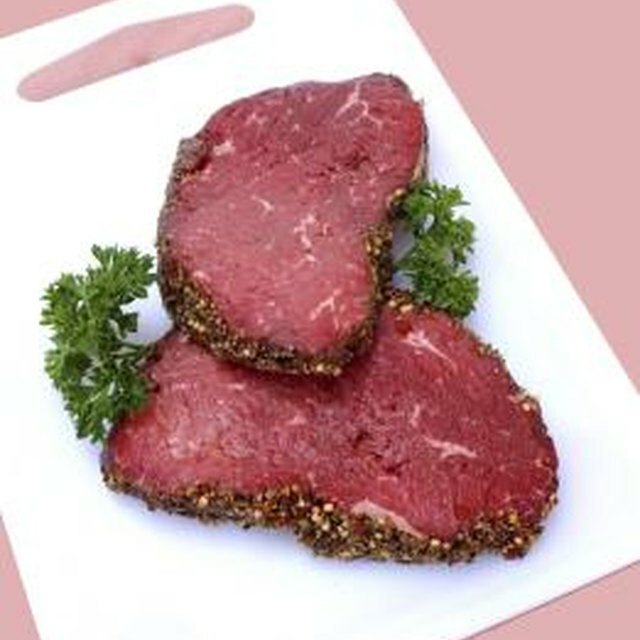 Rub the steak generously with olive oil; sprinkle it with coarsely ground pepper. You can also sprinkle the meat lightly with your choice of dried herbs, such as marjoram, rosemary, thyme or sage. Place the steak carefully on the preheated pan; broil the meat for 3 minutes. Flip the meat with long-handled tongs and broil the other side for 3 minutes. Turn the oven off broil and to 500 degrees Fahrenheit; continue to cook the steak to a desired level of doneness. For example, for a 3/4-inch top chuck steak cooked to medium-rare, cook the meat to a minimum temperature of 145 F, which requires approximately 4 to 5 minutes per side. For a medium steak, cook the steak to a temperature of 160 F, and to 170 F for a well-done steak. Check the temperature by inserting an instant-read meat thermometer into the thickest part of the steak. Remove the steak from the oven and transfer it to a plate. Cover the steak with a loose tent of aluminum foil to keep the meat hot and let the meat rest for at least 4 to 5 minutes before serving. Resting is a critical step because the steak continues to cook to a safe temperature. Resting also allows the juices to settle back into the meat, resulting in meat that is juicy and easy to cut.